From left are Bonnie Green, executive director of The Patuxent Partnership; Ashley Johnson, NSWC IHEODTD technical director; Scott Kraft, NSWC IHEODTD commanding officer; Tuajuanda C. Jordan, St. Mary’s College of Maryland president. 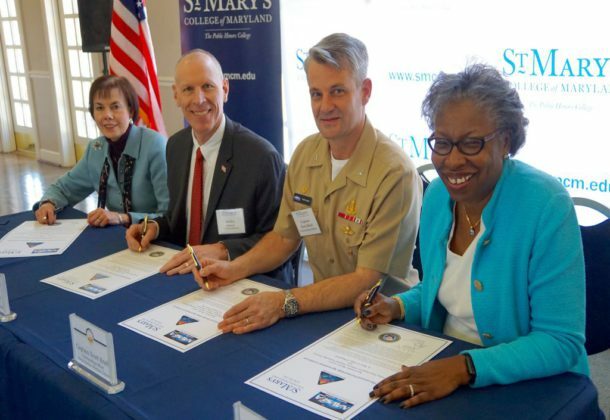 The Naval Surface Warfare Center Indian Head Explosive Ordnance Disposal Technology Division (NSWC IHEODTD), St. Mary’s College of Maryland (SMCM), and The Patuxent Partnership formalized an educational partnership agreement that will advance scientific research and foster academic growth in science, mathematics, technology, and engineering. Representatives from each organization gathered on the college campus to sign the agreement on March 23. The signers included Tuajuanda C. Jordan, St. Mary’s College president; NSWC IHEODTD Commanding Officer Capt. Scott Kraft and Technical Director Ashley Johnson, and Bonnie Green, executive director, The Patuxent Partnership. Building partnerships is the number two strategic objective for NSWC IHEODTD, Mr. Johnson stated in remarks during the ceremony. “This partnership is just another example of how we can leverage the knowledge around us in Southern Maryland to enhance energetic materials and systems to better support the Navy,” said Mr. Johnson. The educational partnership agreement will provide opportunities for scientists and engineers at NSWC IHEODTD to work with SMCM students and faculty, combining knowledge and skills with the unique facilities and capabilities at NSWC IHEODTD. St. Mary’s College and The Patuxent Partnership are also part of an education partnership agreement with Naval Air Warfare Center Aircraft Division (NAWCAD), which has enabled students to be placed in NAWCAD research and development labs to develop solutions to real-world problems faced by the US Navy. “For us, it’s about collaboration, STEM education development – connecting the dots and seeing how we can build the STEM workforce of the future starting here in Southern Maryland,” said Green.